11 days before Christmas he turned up outside my window. Made quite a commotion so there was no way I could ignore him. 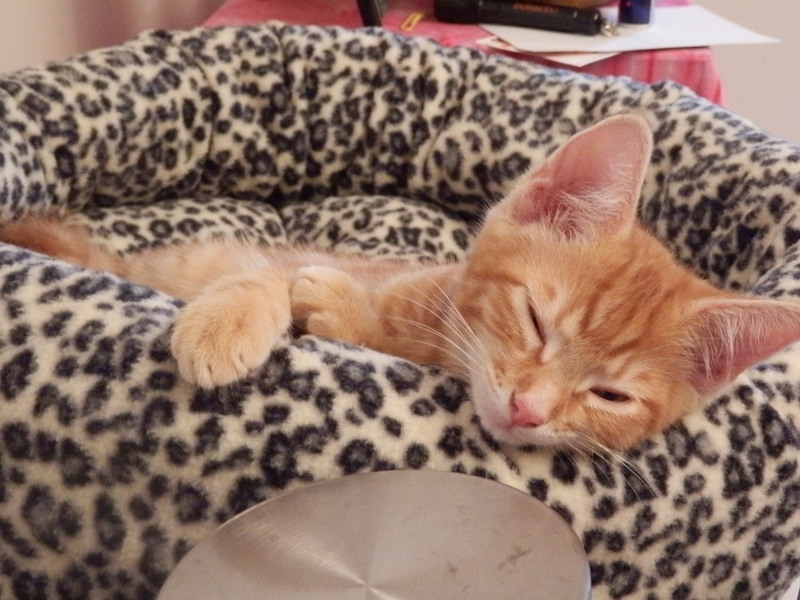 I took him in, fed him, cuddled him, shared my bed with him – he stayed four nights, long enough for me to fall in love. And then he disappeared and broke my heart. Like a typical boy. Okay, so that wasn’t quite the whole story. When this cute little ginger and white kitten showed up and strolled into my house like he owned the joint, I really wanted to keep him. I thought he might have been dumped, but I was also concerned that there was a family pining for their cute lost kitten. So I did the ‘right thing’ and took him to the RSPCA to see if he’d been microchipped. 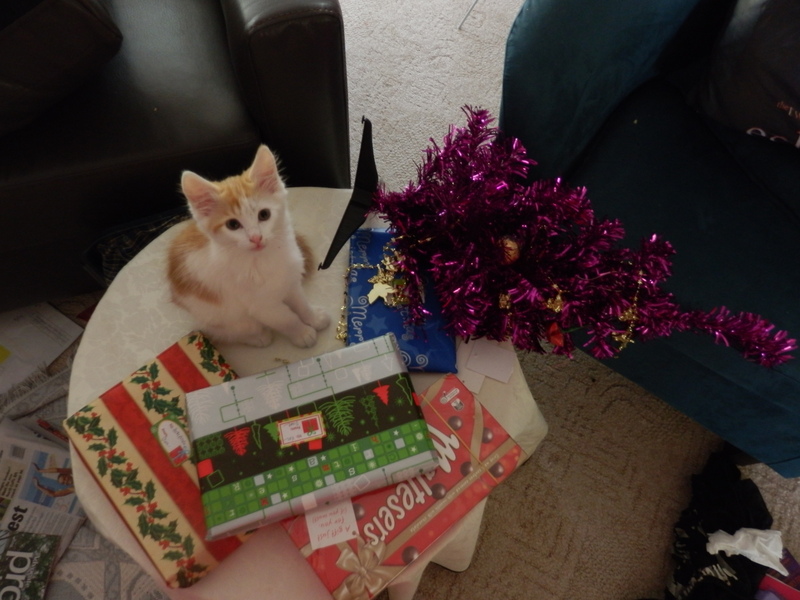 There was no microchip but there’d been a phone call about him, and very sadly I said my goodbyes to the little boy who thought he was a parrot and delighted in knocking over the Christmas tree. The next morning I received a phone call from the lady who’d picked ‘Benny’ up from the RSPCA, asking if I wanted to give him a home. Of course I did and I arranged to pick him up the next evening. I decided I wanted to call him Elvis. I went out to dinner that evening, happy that ‘Elvis’ was going to be coming home to me. But when I got home from dinner, I got another phone call. Little Elvis, along with his brother Bobby had wandered off again — and while Bobby had been found down at the roadside, there had been no sightings of Elvis. I couldn’t believe he’d disappeared again, couldn’t believe they hadn’t ensured he was safe. So I went and met the neighbours and Elvis’ brother Bobby. A huge cardboard sign about a lost ginger kitten was placed at the start of the road, and I made up leaflets and did a letterbox drop. I sent calls out to the universe to send Elvis back to me in time for Christmas, but he didn’t turn up outside my window and meow as he did that first night. Two days after Christmas, I had a call on my mobile while I was shopping. 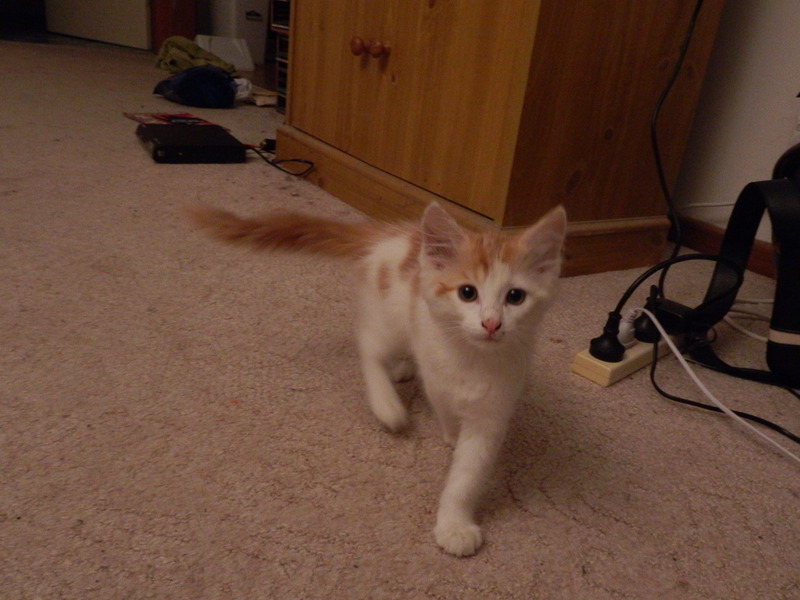 A kitten had been found in my road at one o’clock that morning. I was so excited that Elvis may have been found, and when they got out of the car, I realised the kitten in their arms was not my boy, but his brother. I made some quick phone calls to find out if Bobby was missing then took him home and his owners collected him 30 minutes later. 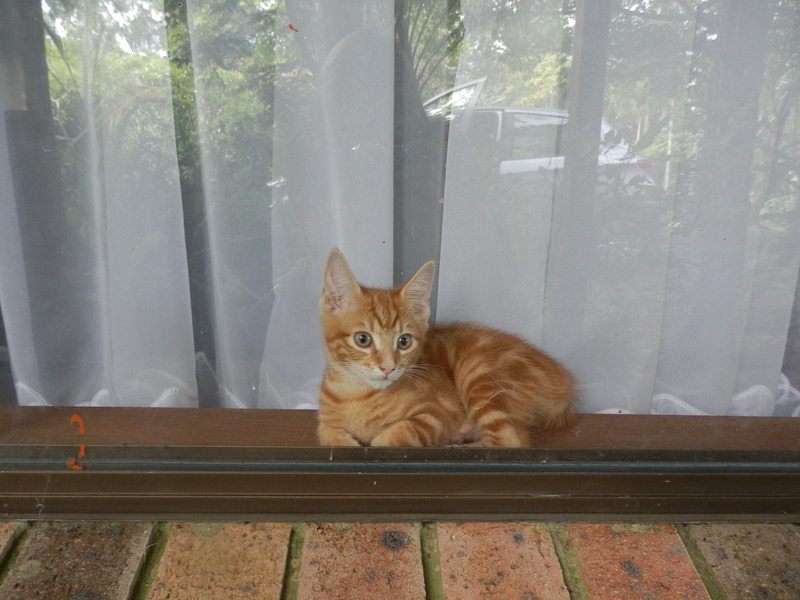 But the next day I got another phone call from the lady who’d picked him up from the RSPCA about a ginger 12 week old kitten who needed a home. Would I like to meet him? So I made the phone calls and went to meet him on the Saturday and brought him home with me. 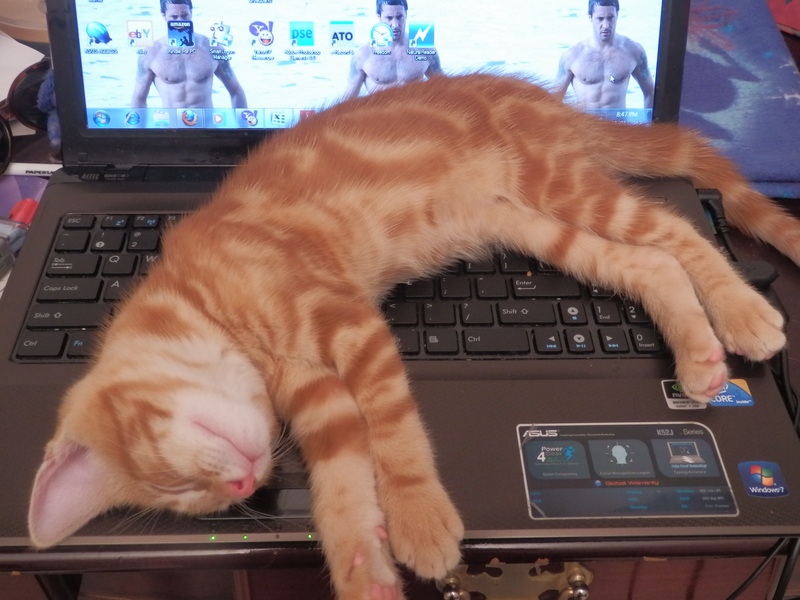 He was unnamed for a couple of days while he demonstrated his personality, his pechant for literature, and his habit of lying across keyboards. It didn’t take long for this little fella to fill the gap that Elvis had created. He’s also adapted very quickly to my other constant visitors. 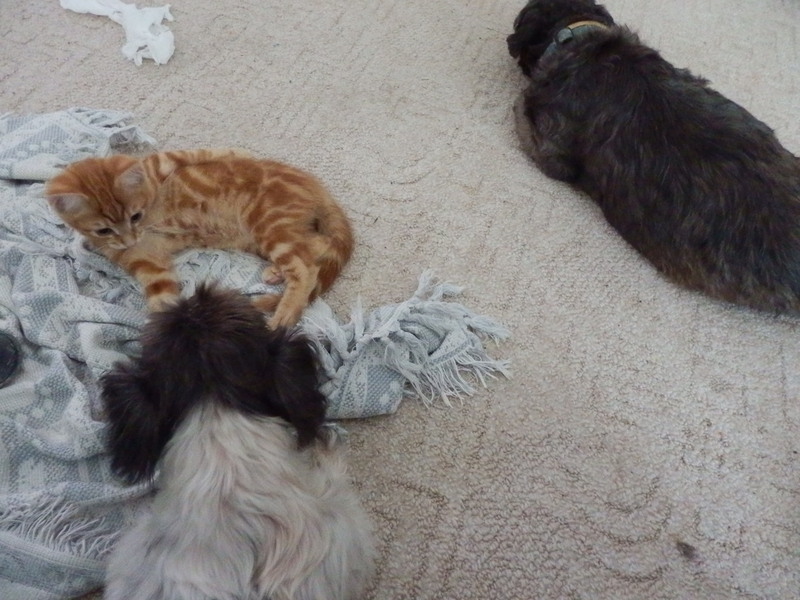 Tina the shi tzu and Qwerty are best mates now, but Lou has his nose out of joint, and yet still chooses to visit. It’s very nice knowing that I’m coming home to this little fella each day. So that’s how Lord Qwerty Byron came to live with me. Considering his predecessor Dorkus had his own blog and Qwerty’s love of the laptop, do you think Lord Qwerty should continue the tradition? Welcome Lord Qwerty Byron! So cute. And I hope Elvis is safe and sound. That was so cute I cried ! Of course he should continue the feline literary tradition. 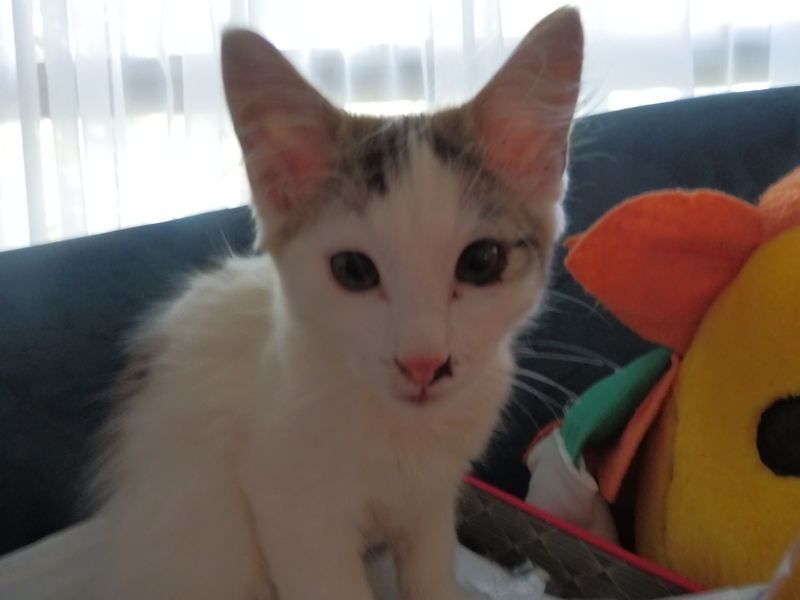 I’m still hoping Elvis turns up – but I can see why Qwerty has stolen your heart!